Looking for some sunshine? Or perhaps a calm after the storm? Come to Wizard because Wild Weather will bring you what you want! This 5 reel, 18 payline slot by Tom Horn Gaming has a very minimalist look to it. The design is very simple with quaint weather inspired symbols. As you play, you'll hear a range of weather-inspired sounds which are actually very calming to listen too. Features meteorologically-themed include expanding wilds and a bonus round that awards 5, 10 or 15 free spins. 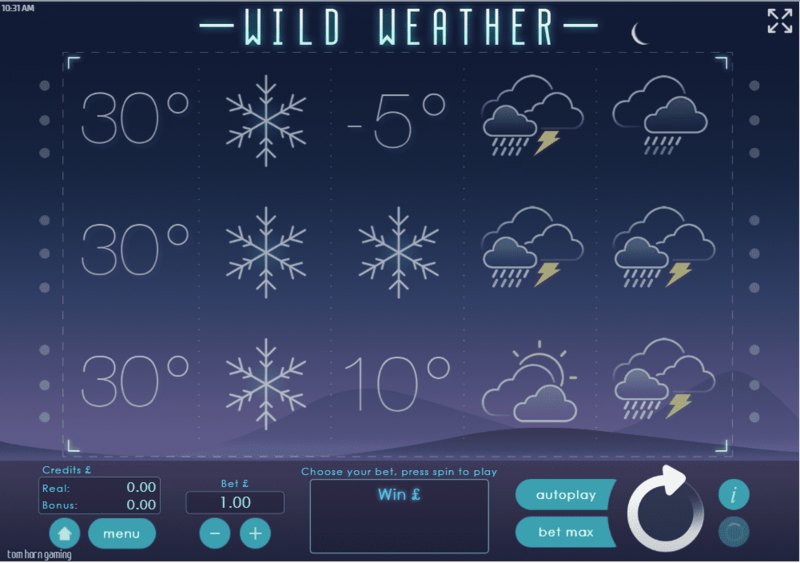 Recognized as among the best slot games, Wild Weather is a meteorologically-themed created by Tom Horn Gaming. It has 5 reels, 18 paylines, and a win both ways system. The design is very sleek and modern with a minimalist theme and dainty meteorological symbols. Behind the reels, you'll see a simple, cold blue background. It almost looks as if there should be someone at the side telling you what the weather is going to be like today. Just like a weather forecast, you'll see symbols including clouds, sunshine, rain, thunder, snowflakes, and various temperatures. Weather Symbols - The lowest paying symbols are the clouds and sunshine and clouds symbols. These award up to 10x your total stake. Next, come the rain and snow symbols. These grant you a multiplier of up to 15x when you form a winning combination. The highest paying symbol is the mighty thundery shower cloud symbol. Landing 3, 4 or 5 thundery clouds will award you with a 4x, 10x or 20x multiplier retrospectively. For more lucky wins, keep a lookout for the tornado symbols. When a tornado strikes in the main game, it will expand and fill the whole reel with wilds. 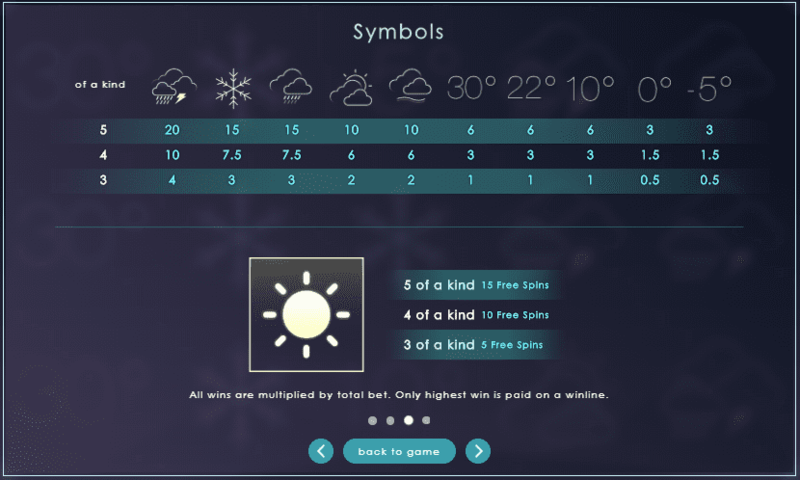 The Scatter Symbol - The scatter symbol in this slot is the sunshine. Land 3 or more scatters on the same spin to unlock the free spins feature. Once unlocked, you'll be awarded either 5, 10 or 15 free spins. The tornado feature doesn't work during this feature, but instead, the one to look out for is the sunshine. When the sun appears, it will expand to a 2x2 square making 4 symbols wild. Wild Weather is a fairly straightforward slot. The design is rather simple but sometimes that makes a nice change! Its unique weather theme is also fun too. There are plenty of opportunities to win some fantastic prizes, especially with the tornado filling the entire reel with wilds and the sunshine creating blocks of 2x2 wilds. If you liked Wild Weather, why not try Vegas Diamonds?